The bija (or beeja) mantras of the seven primary chakras are one-syllable seed sounds, with the first five mentioned in the Jabala Darsana Upanishad: "Sage, also it is necessary to chant the pancha bhootha (five primary elements) mantras, namely: Ham, Yam, Ram, Vam and Lam. ", and the last two comprised of Aum (Om) - best outlined in the terse twelve verses of the Mandukya Upanishad, and its "silence", or the soundless aspect of Aum. When spoken or chanted, the bija mantras activate and resonate the energy of their associated chakras, to help create balance and harmony in an individual's mind, body, and soul. Used in chakra meditation, hatha yoga, kundalini awakening, tantric practices, vedic healing, and similar modalities, these sounds are thought to purify and guide the practitioner toward a higher state of consciousness. Bija mantras meditation is also referred to as Shristi Karana, or recreation of the body through sound. As a world fusion musician, I decided to use one of the Bhuta Shuddhi (or Bhoota Shuddi) methods, which translates to "cleansing the elements" or "purification of the elements", as the focal point for this release. It is an ancient, fundamental process that blends several yoga practices, and is clearly defined in both Tantra and Yoga classical texts. Bhuta Shuddhi methods can be applied by themselves, or as a part of a comprehensive meditation practice. Experts suggest some simple stretching exercises or asanas (yoga postures), along with pranayama (breathing exercises), for up to fifteen minutes prior to beginning your bija mantras meditation; and also ending with another form of meditation, once again up to fifteen minutes, either along a "favorite" mantra, or in silence. They also suggest that each bija mantras meditation lasts about thirty minutes, for a total session of one hour. Try to sit in a comfortable posture, such as: siddhasana (accomplished pose for men) or siddha yoni asana (for women). Make sure your spine is erect, close your eyes, and try to relax your entire body. Breathing normally, begin to focus your awareness at the first/root chakra, specifically its physical position. Chanted or spoken aloud, along with a track. Chanted or spoken internally, along with a track. (Some claim that this is the best method). Call-and-response: Chant the individual mantras immediately after you hear them on the track - either aloud or internally. Combination: Chant aloud with a track, and internally during the time intervals. Since there isn't one method that will work with all individuals, you are highly encouraged to try several of them, to find out which one is best suited for you. If you are completely unfamiliar with the bija mantras, please skip ahead to Pronunciation Guides: for more information on the individual syllables. This track begins with about one minute of fade-in music, to give you some preparation time. Each bija mantra is chanted aloud nine times, followed by an identical period of time with just music. The above sequence is repeated for each mantra, in the ascending order (physical location): Lam (base of spine), Vam (pelvic area), Ram (between navel and solar plexus), Yam (center of the chest, at heart level), Ham (throat), and Aum (between the eyebrows, behind the forehead). A long, single Aum (crown of the head) ends the ascending sequence. (Note: Nine repetitions times two of each mantra equals eighteen. 18 times six syllables equals 108 - the mystical number in Vedic & Hindu traditions. The long, single Aum symbolizes the 109th bead, or "guru bead" in Yogic tradition, where students flip their mala around in their hands, and continue reciting, as they move backwards through their necklace. In addition, the number 9 is associated with Brahma, and with the two repetitions, both the additions of 1+8, and 1+0+8, result in 9, so the schemes of these tracks were meticulously chosen, and in accordance with tradition. The music gets gradually quieter for about a minute. This span of time should be used to focus solely on the crown chakra. About five minutes in, the music will begin to gradually get louder, and the entire sequence is repeated in descending order: single Aum, Aum, Ham, Yam, Ram, Vam, and Lam. The track ends with about a minute of fade-out music. This guided meditation is arranged identically as Purusha, but in a slightly different tempo, and obviously completely different music. It begins with ninety seconds of fade-in/preparation time. Once again, each bija mantra is chanted aloud nine times, followed by an identical period of time with just music. The above sequence is repeated, so each individual bija mantra section lasts exactly thirty seconds, in both ascending and descending order. Music gets gradually quieter for about a minute after the single Aum. About five minutes in, the music gradually gets louder, and at the five and a half minute mark, the sequence in descending order begins. This track ends with ninety seconds of fade-out music. The purpose of these tracks is three-fold: you can use them in conjunction with the bija mantras, as intended; use them with any other mantra(s) of your choice; use them as background music for your silent meditation, relaxation, yoga practice, etc. The music is exactly the same as the guided meditation track, but I added some sinusoidal panning to make it slightly more dynamic. 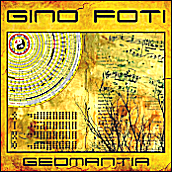 A complex set of synthesizer beds and themes, drones played on MIDI bass guitar, with elements of mostly Indian music, and a touch of European Classical. Purusha (or Purusa) is a complex principle closely associated with Shiva, and the attributes of pure consciousness: unchanging, unlimited, unswayable, connecting everything and everyone, according to various schools of Hinduism. In the early Vedas, Purusha symbolized a cosmic man whose sacrifice by the gods created all life, and the concept evolved in the Upanishadic period to the abstract essence of Consciousness, Self, and Spirit. Once again, the music is exactly the same as the guided meditation track: an East-meets-West fusion of synthesizer themes, beds and drones, with elements of Indian music, European Classical, and even some dark ambient & new age. The title can be translated to "Nature", referring to the feminine aspect of all existence, or the principle of matter, best symbolized by Shakti, and the obvious counterpart to Purusha/Shiva. Energy, movement, and power are its main attributes. This track follows the contours of Purusha, while musically resembling Prakriti, featuring an ebb-and-flow through the seven sections, with some slight variations. Shiva is usually portrayed holding a trident, which represents the trinity of Purusha, Prakriti, and Ishvara (or Ishwara) - the eternal, formless, and omnipresent divine principle. 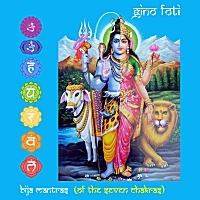 As depicted on the cover artwork, the principles behind the bija mantras, and the primal powers of Shiva & Shakti, can be seen as one half of the same supreme being: the divine mother that surrounds us with caring, protection, and warmth on the left; and the paternal love that gives us clarity, consciousness, and knowledge on the right. Only when Shiva & Shakti are united can action, creation, and movement take place. Energy without consciousness is aimless. By itself, it is incapable of producing anything. Only consciousness can give it content, direction, and form. Conversely, consciousness without energy is a dormant, latent power. It is said that Shakti resides in the Muladhara, or root chakra, and Shiva in the Sahasrara, or crown chakra. When Prakriti and Purusha unite in Sahasrara, knowledge, the knower (or subject), and the object of knowledge become One. This is a timed meditation, arranged for a ten-minute session, but can also be looped for longer periods. A slowly evolving composition, performed in real-time on MIDI bass guitar and MIDI bass pedals, with the bells added during post-production for precise timing. After thirty seconds of fade-in music for preparation time, it begins with three singing/temple bells. You will then hear a single bell every minute afterwards, up until the ten and a half minute mark, where you will once again hear three. These are followed by thirty seconds of fade-out music. Kala (or kaalam, kaala) is the Sanskrit word used to refer to time, or duration, and also one of the many names of Lord Yama, the god of Death. It is directly connected to Shiva, who is sometimes called Maha Kala, or "The Great Time", and regarded as an aspect of Prakriti, signifying the energy in Time. Prakriti subjects the boundless individual souls of pure consciousness to the limitations of knowledge, space, and time, binding them to Samsara, the endless cycle of death and rebirth. Any being than can transcend these limitations, through Lord Shiva, will regain their pure consciousness, and become truly free. Sitar drone, three-note arpeggio, with resonating sympathetic strings, performed on MIDI bass guitar, continuously looped, to help induce a trance-state. Tridevi refers to the "Three Goddesses", typically personified by Lakshmi, Parvati (or Kali), and Saraswati - all different forms of Shakti. As part of the Navratri festival, which lasts nine nights, the Tridevi is worshiped in three night intervals: Parvati or Kali, followed by Lakshmi, and finally Saraswati, the goddess of music and knowledge. These tracks are comprised of nine repetitions of each bija mantra, three seconds apart. It is said that when sounding the bija mantras aloud, you are connecting with their specific element, and the energy associated with its primary chakra. When the seed syllable of the root chakra (earth energy) is properly pronounced, it excites the nadis, the subtle channels of energy in your body, to prevent a downward movement. Through repetition, and by concentrating on its physical position at the base of your spine, the vibrations create a passage into the brahma nadi, awakening the Kundalini - the coiled, spiritual energy usually depicted as an intertwined twin serpent, allowing it to move upward toward the crown chakra. The sound produced is similar to the syllable in the English word a-lum-ni, or a-lum, created by curving the tip of your tongue toward the soft palate - the back of the roof of your mouth. When the seed syllable of the sacral chakra (water energy) is properly pronounced, it enhances the production and circulation of bodily fluids, as water is the essence of your body, making up the overwhelming majority of it. The sound can be produced by placing your upper set of teeth slightly inside your lower lip, and mimicking a racing car, as in V-room, and rapidly adding um, as in um-brel-la, to it. When the seed syllable of the solar plexus chakra (fire energy) is properly pronounced, it contributes to your longevity and ojas, or radiant health, as well as the rapid movement of the Kundalini, since the nature of fire is to move upward. It is said to also aid in the digestion and absorption of food, supplying your entire body with vital energy. The sound produced is similar to the syllable in the English word rum-ble (or even a slight exaggeration of the alcoholic beverage of the same name), created by placing the tip of your tongue toward the hard palate - front of the roof of your mouth, and rolling the R, as you would with words of the Romance languages (French, Italian, Spanish, etc.). When the seed syllable of the heart chakra (air energy) is properly pronounced, it is said to be the dawn of true knowledge in your consciousness. Aiding the functions of the lungs, as well as your heart, at this point energy can move up or down, making it a crucial point for your session. In fact, the symbol for this chakra is a six-pointed star made up of two triangles, symbolizing the balance of energy between Shiva, the triangle pointing upwards, and Shakti, the downward-pointing one. The sound produced is similar to the syllable in the English word yum-my. Begin the sound from the back of your throat, and allow it, along with your breath, to completely fill your mouth and throat cavity. When the seed syllable of the throat chakra (ether energy) is properly pronounced, it helps cerebrospinal fluid to flow more freely, and aids your sense of hearing, as well as speech. After this chakra, the practitioner is said to become a tattvatit, or one who has gone beyond the influence of the five primary elements. The sound produced is similar to the syllable in the English word hum-ming. Like yam, it should begin from the back of your throat, allowing it, with your breath, to extend further than the resolution of the syllable, and letting it resonate in your throat cavity. The primal cosmic sound is the seed syllable of the third eye chakra, drawing the light of the individual into the light of the divine. It it said to play a critical role in the piercing of the rudra granthi, where the illusion of individuality is dissolved, and the experience of higher consciousness begins, culminating at the crown chakra. There are myriad additional functions and benefits of this sacred syllable that go beyond the scope of this release. For a proper pronunciation, Au should be sounded as a diphthong, or gliding vowel, formed by the combination of the two vowels in a single syllable, in which the sound begins as the 'a' in palm and moves toward 'u', as in put. Like the last two bijas, the m is pronounced like a humming sound. In fact, Aum is considered a sacred sound called pranava, which literally means "humming". All together, the sound produced is similar to the English word home, without the 'h', beginning by opening the mouth slightly, without touching the tongue to the palate (A), then slightly closing the mouth as if you were about to whistle (u), and finally closing it to produce a humming tone (mmmm). This fifty-second track includes one repetition of each bija mantra, three seconds apart, ascending and descending, with a long Aum in the middle, to familiarize yourself with the proper sequence.